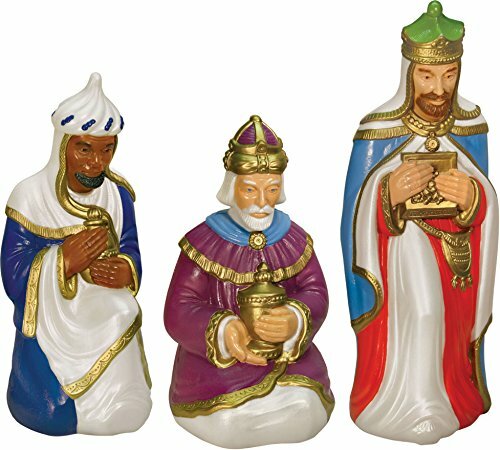 This lighted blow mold Nativity Collection Wise-Man set from General Foam will make a great addition to your holiday décor! Made of durable polyresin, this set is ideal for indoor or outdoor use. During the day, the pearlized white finish of the Wise-Man set provides added interest and glow and the painted features will enhance each of the wise-men's appearance. The Standing Wise-Man stands 36" tall, the Kneeling Wise-Man 28" tall and the Sitting Wise-Man 25" tall. They look great placed in your yard or on your porch. The Wise-Man Set can also be used for indoor use so you can create your own Christmas scene. For your convenience, each figures comes with its own 4-foot cord. Made in America, this General Foam Plastic blow mold Wise-Men Set will surely light up your holidays for years to come!